Cheese making has become a seasonal chore for me. By trial and error I've learned that I cannot make all cheeses during all times of year, even if I have the milk. This has been part of learning to live with my environment. In the heat of summer, I focus on making soft cheeses and mozzarella. I save the making of hard cheeses for when the temperatures become more autumnish, like now. One of this year's first cheeses, all dressed up in red cheese wax. If you look through detailed instructions for making cheese, you will note how specific the temperatures are. The following are examples from Ricki Carroll's Home Cheese Making. "It's important to drain the cheeses in a place where the temperature stays close to 72°F." "Air-dry the cheese at 50°F for 3 weeks. " "Most cheeses prefer an aging temperature between 46 and 60°F and a relative humidity of 75 to 95 percent." Fresh out of the cheese press. Since Dan and I don't use air conditioning, my biggest cheese making challenges are those steps which require specific air temperatures. When the heat and humidity in the kitchen and pantry are high, my newly pressed cheeses don't dry; they remain moist and mold easily. I can battle the mold with vinegar and salt, but they never seem to develop a nice rind. If they dry enough to wax them, the resulting cheeses have an unpleasant sharpness and a lot of mold to cut off. According to Ricki Carroll, this is what happens if when temperatures are too high. Mold and acidity increase to the point where the cheese is not a good one. My solution has been to make such cheeses in the autumn, when temperatures are milder. And the beeswax? When I used up the last of my cheese wax, I decided I was going to try beeswax instead. Cheese wax is expensive, and even though it can be saved and reused, it still must be purchased. When we got bees, I chose the Warré beehive because it meant I could harvest beeswax as well as honey. I use beeswax in my herbal salves and want to make candles for emergency lighting someday. in "cones" which I think are made in styrofoam cups as molds. I waxed two cheeses with straight beeswax, and then discovered what others already know; that the wax is brittle and cracks easily. Suggestions to make it more pliable include adding a bit of vegetable shortening, lard, or coconut oil. I removed the beeswax from the cracked wax cheese, and then added a lump of coconut oil to my beeswax pan. I rewaxed the cheese with better results. I wax my cheeses by dipping them. I've tried brushing the wax on, but sheesh, what a mess I make (it's the same with paint and a paintbrush). It still has a honey smell, so I'll be curious as to how that effects the flavor of the cheese after it ages. One idea I read about is to use crayons (which are made of food-grade wax and colorings) to color the wax. That would be handy for identifying different types of cheeses. This particular cheese is my standby - #15. It doesn't use a purchased cheese culture and you can find the recipe here. For a number of good recipes using beeswax (including cheese wax), check out the "Beeswax Recipes" from John & Debra Bruihler. Also Rona’s “Beeswaxing” Method and this thread from the Permies.com forum. An excellent article about proper waxing and storing (do hard cheeses really need refrigeration?) is "Settling the Cheese Wax Controversy" by Preparedness Pro. My Black Australorp pullets started laying last week. I got my first egg on Wednesday, three more the next day, and one or two every day since. I have 11 Australorp hens, so they should keep us well-supplied with eggs. Pretty nice size for pullet eggs, I think. Their hatch day was May 13, so the first eggs came at 23 weeks old. I should be getting eggs throughout the winter. :) Even before they started molting, my old ladies were down to about 2 to 4 per day for 16 hens, so it's definitely time for some new blood. In some ways, it's hard to believe that October is almost over. Where does the time go? Earlier this week we were under a frost advisory for several days. No frost and I hope we'll have a late first frost - like in November. There's still so much to do! Here's the list autumn chores we've been busy with. finish the harvest: cowpeas, corn, amaranth, winter squash, sweet potatoes, etc. We always clean out the stoves and stove pipes, but this year we also replaced the catalytic combustor in our wood heat stove. When the interior of the stove gets to about 500° F (260° C), the combustor is engaged and begins to burn the gases released in the burning of the wood. The result is cleaner, pollutant-free white smoke, and more heat! A combustor needs to be cleaned regularly for top efficiency, but also it has a lifespan and must eventually be replaced. Ours is about six years old and the ceramic has become chipped. We decided to with a steel one, because steel will be sturdier and last longer than ceramic. Since this is our first year with honeybees, I had one new autumn chore: add a mouse guard to the entrance of the hive. In winter a beehive offers mice warmth and food. The bees are much less active in cold temperatures, so mice will dare to enter. During warmer weather, the bees will defend against their entrance and sting them to death. The bees have taken this new obstacle in stride. I used two pieces of half-inch hardware cloth. I doubled it in a slightly offset fashion because I wasn't sure if a mouse could squeeze through a half inch opening. Some say they can't, some say the can. but so far no comb is being built even though the bees are still very busy. I thought that if they filled the bottom of the four hive boxes, I might be able to harvest the top and leave them two honey boxes for the winter plus a nest box. I got a late start with this hive, so I'd rather they have good winter stores than an early honey harvest. There's always next year for that. And here's something that's useful for winterizing - a door draft stopper. I need one for each of our exterior doors. Our temperatures have turned mild again and the leaves on the trees are changing. I'm glad to have most of those seasonal chores behind us. What about you? Are you preparing for the change of seasons? Even though Kinders are aseasonal breeders (can breed year around), autumn still seems to be a favored time for breeding. I'm not sure if it's because it's a traditional time or if spring is a nice time to have kids, but it seems most Kinders are bred to kid in the spring. I like my kids to be born as the weather is just beginning to warm up, because I'm more concerned about hypothermia than coccidiosis (which is more prevalent in warm weather). According to this article, "The Dual Purposes of the Kinder Goat" by Sandra Mauerhan, preliminary research indicates that Kinders bred between August and December produce more triplets, quads, quints, even sextuplets. Breeding between January and July produces more singles and twins. Maybe that's another reason most breeders prefer fall. Finally, I found Daphne standing at the fence hollering and wagging her tail for the boys. My observations had targeted her for September 1st, but that came and went with no signs of heat, so I was getting a bit anxious. Her intended for this year is Clark, my younger buck. in rut, they're scruffy, scrawny, and stinky with their minds only on one thing. They happily spent the day together so I've got Feb. 23 circled as her potential due date, especially if she doesn't go into heat (which would be about now, so far so good). Who else do I have in mind for Clark when they are a little older? Stella is now six months old. This is because my other buck Randy is their sire. Randy is Stella's and Jessie's sire. Speaking of Randy, he got put to work as well, because when I checked on Daphne and Clark I found Lini right there at the fence where they were, with her tail wagging like crazy. Lini is 10 months old. What are they looking at? The raccoon. So she got to go visit Randy. They were both very interested in one another. I thought all was well until the next time I went outside. Lini had somehow slipped through the gate and was in with the two bucklings destined to become chevon. They were taking full advantage of the situation! The reason they're for chevon is because they are not breeding quality. What's the big deal, you might ask? For some folks it might be no big deal at all, but when one is breeding registered goats, the breeder must know the sire in order to apply for registration papers. The advantage to that is a much higher selling price for registered goats. I had three choices. I could just say "Oh well" and chalk this up as a lost year for my Kinder breeding, I could ask the vet for a prescription of Lutalyse to terminate a possible pregnancy (if there was one), or I could wait and have DNA testing done. While I waited for the vet to return my call, I researched DNA paternity testing for goats. Apparently it's quite common because a lot of labs offer the service! I learned it can be done with either blood or root hairs. The latter one was the least expensive and is done by UC Davis for $40 per animal (link here, for anyone interested.) That would not be my first choice because it would mean one dam, three possible sires, plus however many kids times $40 each. Why would all the kids have to be tested? Because those multiple births mean multiple ovulations, which means a batch of kids could all have different daddys! Violet is six months old. She'll have to grow up a bit to become a mama. because any time she sees me she comes to get petted. That's my plan, assuming the goats will cooperate! Those of you interested in permaculture have likely read Masanobu Fukuoka's The One-Straw Revolution (available as a free download here). His natural farming method of growing grain is brilliant, yet simple. He does not plow, till, nor add fertilizers or even compost. In summer, he grows rice, in winter, a grain mixture of barley and rye. He uses the straw from his grain harvests to mulch the growing plants. He adds a bit of chicken manure to help decompose the straw and that's about it. This ongoing cycle is not labor intensive, yet productive. Sadly, it wasn't for me. Why not? Because that straw is valuable homegrown goat feed, and I would rather my goats eat our own hay than purchased hay. We've been having our soil tested for microminerals and slowly adding them, so I know our own soil and hay are healthier than anything I can buy. I needed to figure out something else. When it came time to plant for winter forage for the goats, I decided to modify the Fukuoka method as an experiment. That experiment is to plant the seed and then mulch with goat shed cleanings. Usually we muck out the shed and use it to make compost piles in the chicken yard, where the chickens help turn it into gloriously lovely compost. Our chickens help us make faster compost with less work on our part. This time I decided to skip the composting step and use it directly on the pasture. I use the deep litter method, so the goat stalls contain a gold mine of straw, wasted hay, manure, urine, and barn lime. There are different kinds of lime (for more on that, see my "Amish Whitewash" post). Barn lime (calcium carbonate) is also called agricultural lime, garden lime, or lawn lime. This is the stuff that's used to mark the lines on sports fields. It not only helps with odor control in the barn, but also helps with insect control because it is just alkali enough to deter insect eggs and larvae. My soil is acidic and could use a little sweetening, so its addition is good for my pasture soil. I spot-planted the seed fairly thickly in the bare places and then spread a thin, airy layer of straw over the seed, just enough to hopefully hide it. snoopy goats out of my business; I don't want them eating the seed! The idea is to sprinkle, not smother. This is something Mr. Fukuoka stresses in his book. The seeds are somewhat hidden from hungry birds, yet still receive enough light to grow. Clumps are shaken out and spread widely, especially if urine saturated. The straw first mulches the seed and then breaks down to feed the soil. I'm planting for the best variety I can, because goats thrive on variety. I have found that deer plot forage mix seed is cheaper to buy than pasture seed, but contains exactly what I want for a winter pasture. This year I bought a mix of wheat, oats, and Austrian winter peas. 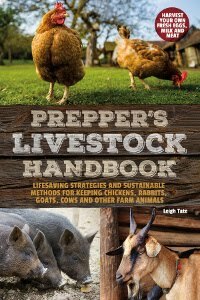 To that I'm adding annual pasture rye grass, also ludino clover and orchard grass (previously purchased perennials), plus garden and herbs seeds I've gathered on the homestead: radish, chicory, turnip, yarrow, parsnip, oregano, and echinacea. There are also pasture grass seeds in the wasted hay and straw. How's it doing so far? 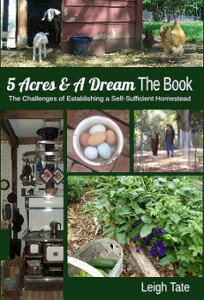 I gave you a glimpse in my "Around The Homestead" post. This is from seed I planted at the end of September. We usually get a dry spell in autumn, so I'm hoping the light mulch will also help retain soil moisture for the newly emerging seedlings. I should also add that chickens and pigs are strictly banned from this pasture at this time, because they'll eat the seed! The goats probably would too if they could see it, but they tend to avoid the smelly wasted hay and straw. The first photo in this post served as my "before" picture; here's my "after," two weeks later. There are still some patchy areas that need seeding, but I'm pleased. Forage plus soil building all rolled up into one. I'm going to declare this first experiment a success! So what have you all been up to while I've been on blog break? Besides working on Critter Tales, here's my news. We've been getting a lot of rain lately: 2 inches during the last week of September, 2.75 inches during the first week of October, and over an inch yesterday. One thing it's done is to give me a chance to evaluate the improvements I did earlier this year to our natural swales. There's still some runoff down the hill, but not as much as there used to be. The worst of all this rain has been what it's done to our corn. One morning, as I went into the goat shed to feed the goats and do the milking, something scampered out of the feed room. Must be one of the cats, I thought. I called, but no cat came forward, so I took a look and saw a raccoon tail. I knew they were around, but so far we'd never seen them. Very cute, but unfortunately they will kill chickens. In fact, the next morning Dan heard a panic in the chicken yard and found the raccoon there. A chicken head count revealed one missing, but without a chicken body it's impossible to guess what happened. Needless to say, I'm going to try out a new recipe or two and Dan would like to try his hand at hide tanning. I've just gotten started on this year's hard cheeses. More on that in an upcoming post. Happily, the squirrels didn't get all the pecans after all. We'll have pecans for us and also acorns for the goats and pigs. I'm happy about that because the last two years were poor in the pecan production department. We've been working on getting our livestock numbers down to what we call "winter level." This is our minimum number of each critter type, to make sure we can feed them all properly and house them in bad weather without overcrowding. Next spring we'll see expansion once again with baby chickens, goats, and pigs. This is my current favorite idea for a Critter Tales cover. I'm thinking about updating my five-year-old blog avatar, so that one photo would change. What do you think? The mild, rainy weather has been good for sowing winter pasture. I've been seeding all the spotty areas using a modified Fukuoka method. More on that next time. More misadventures in goat breeding. Stay tuned. So tell me how October has been going for you so far. 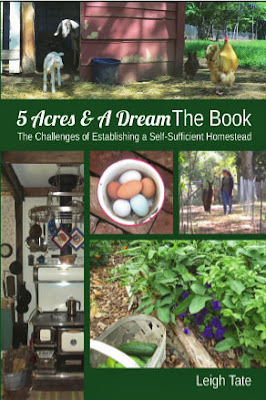 Congratulations to the winners of my 5 Acres & A Dream The Book giveaway! Email me at 5acresandadream at mail dot com and let me know where to send your prize. You'll have until my next blog post is published on Sunday. After that I'll pick another winner. 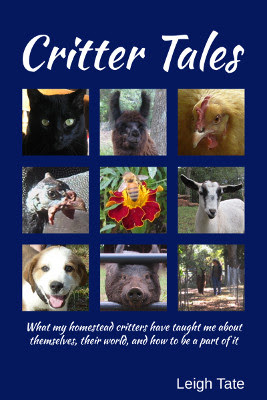 For everyone else, here is a discount code to receive 30% off the $12.95 cover price at my CreateSpace eStore. LDY7AEEZ. Click here, order as many copies as you'd like, and use the code at check-out. The code expires Sunday at 6 a.m. Eastern Time. Thank you to everyone who entered! Thank you for your kind words and encouragements! You are the ones who have made the book a success. You've been the best friends in the world to me. I hope you don't mind this break from my regular blog posts, but this is exciting and I can't help but share it. 5 Acres & A Dream The Book has now sold over 5000 copies! When I hit the "publish" button on CreateSpace nearly two years ago, I was just hoping to sell the typical self-published book lifetime goal of 200 copies. As you can imagine, this has topped my wildest expectations. I'd like to celebrate with a giveaway. And I want to give away not just one copy, but three! To enter, just leave a comment. That's it. But! You can earn extra entries by giving this giveaway a shout-out on your own blog or favorite social media. Just give me a link to your shout-out and you'll get an extra entry for each one. Already have a copy? You can win one as a gift for family, friend, or to donate to your local public library. I'll give you three entries if you'll write a review on your blog or Amazon. Just give me the link in your comment and the entries are yours. Anybody, anywhere, can join in. Multiple entries entitle winners to one copy only. Winners will be announced one week from today, Thursday, October 8, at around 6 a.m. Eastern Time. UPDATE: Click here to see the list of winners.